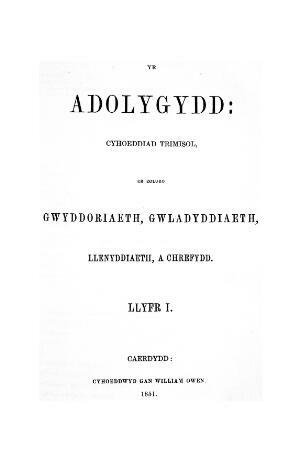 A quarterly Welsh language periodical that, along with providing literary reviews, also encompassed theology, philosophy, politics and education amongst its subject matter. Its first editor was the minister and journalist the Reverend Evan Jones (Ieuan Gwynedd, 1820-1852) for whose benefit the periodical relocated from Cardiff to Llanelli, where he was also editing Y Diwygiwr, Y Tywysydd and Y Gymraes. Following his death in 1852 the periodical was edited by the Reverend William Williams (Caledfryn, 1801-1869). Associated titles: Y Beirniad (1859-1879).